I love Pavlova. 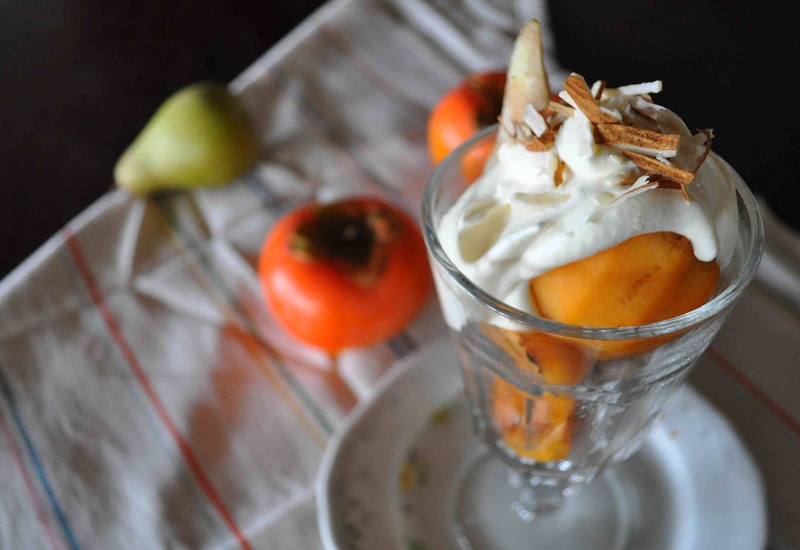 It’s probably my favourite dessert and is one of those things that turns a few simple ingredients into something magical. 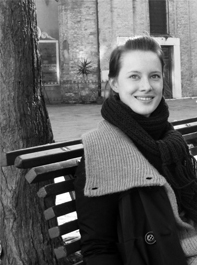 Despite the few ingredients, there are about as many Pavlova recipes out there as there are philosophies for living. In fact they cover a similar spectrum: those which place beauty over substance; those which favour total indulgence in the form of chocolate, caramel or coffee flavourings; those which attempt to strip out all of the fat by removing or replacing the cream; or those show-off recipes involving complicated rolling or stacking. 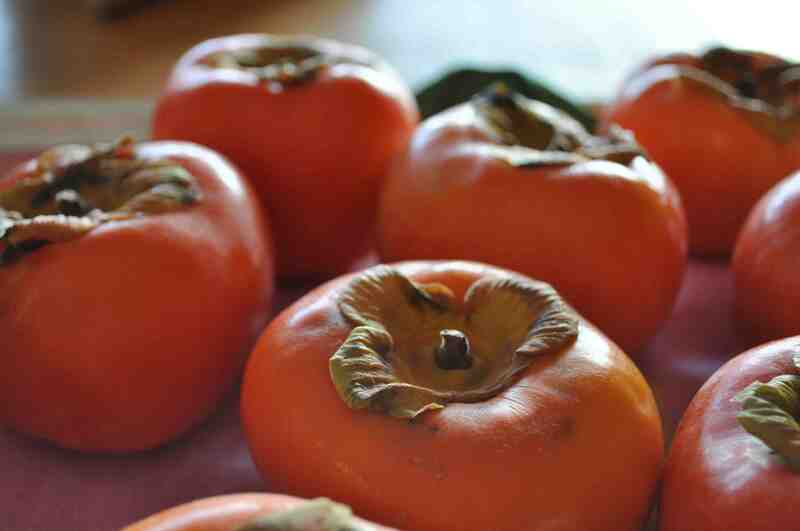 The recipe my Mum gave me many years ago is in a different category. 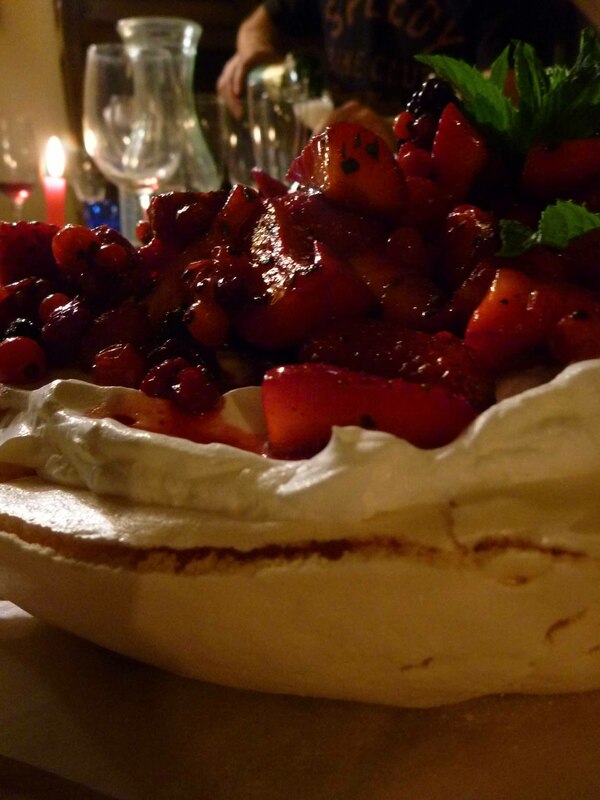 This Pavlova is beautiful, but in a rustic kind of a way. It’s luxurious, but uses just as much sugar as needed (more sugar will mean less collapse, but who cares about a bit of collapsing, right?) Best of all it is incredibly simple, but it has to be done right. 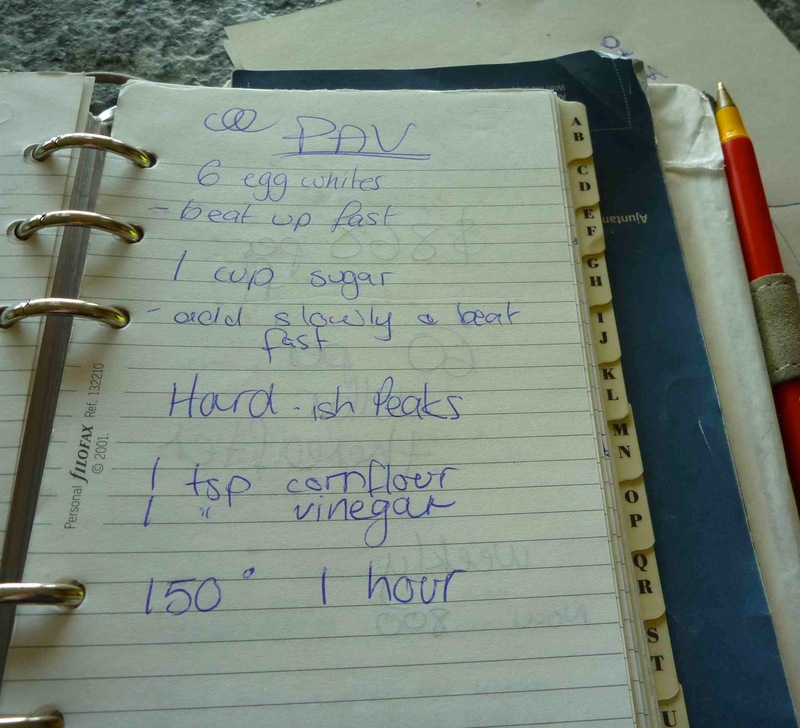 The basic recipe is scribbled into my diary and travels with me everywhere. For those who haven’t done a Pavlova before I thought I’d expand on that a little. But first, a word about eggs. This dessert is fundamentally all about eggs. 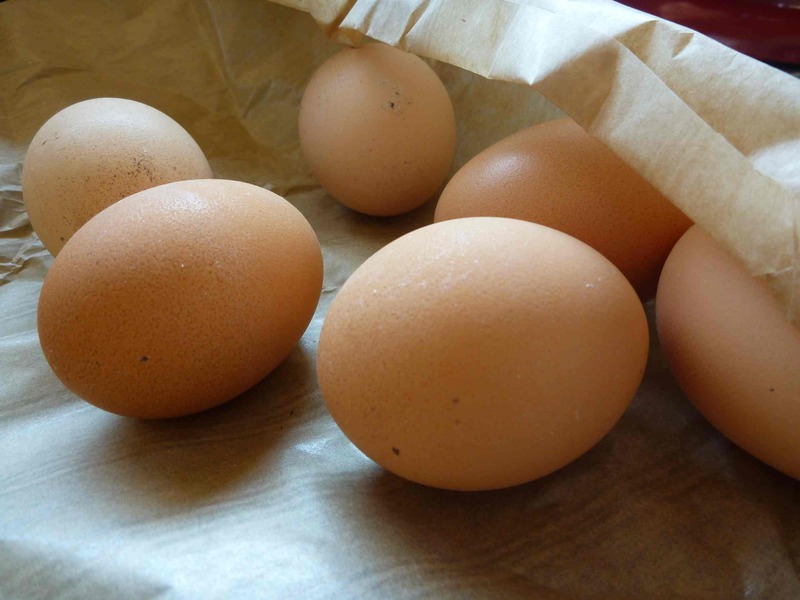 Use lovely free-range eggs from happy chickens as the basis of your Pavlova and it will be a treat to make and to eat. Don’t skimp on the ingredients, it’s not worth it. Lecture over. You can scale this recipe up as you like, although I tend to keep to multiples of three egg whites so the measurements are simple. The Pav I did for these photos (for my birthday!) had nine egg whites to serve 10 hungry people, but we had a little left over. Beyond that I’m not offering any serving advice because it really depends on how indulgent you want to be. freshly whipped cream and fruit to decorate. 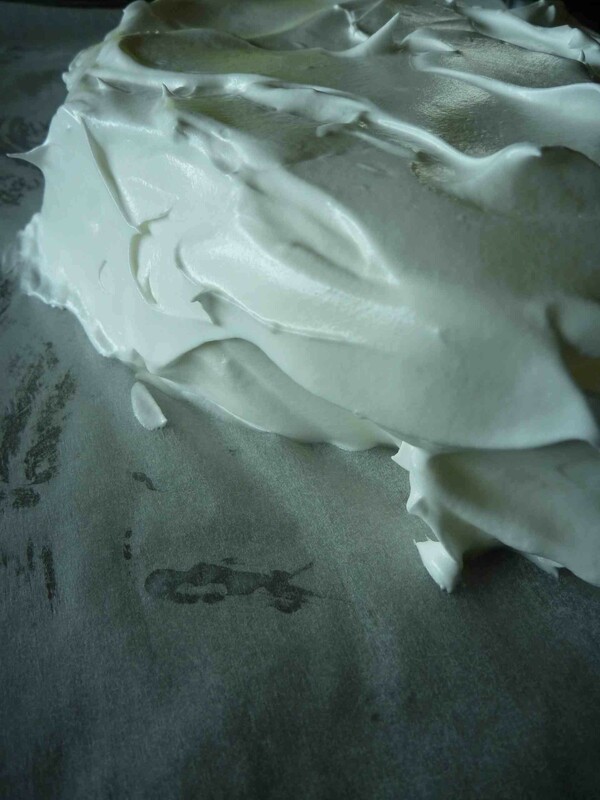 The pavlova base needs to be cooked at least 4 hours before you intend to eat it to allow for the slow cooling time. You also need to consider your oven schedule as this will monopolise the oven for several hours. Pre-heat oven to 150°C and line a large flat baking tray with baking paper ready for the mixture. Wait until the oven is hot before you start beating the eggs. 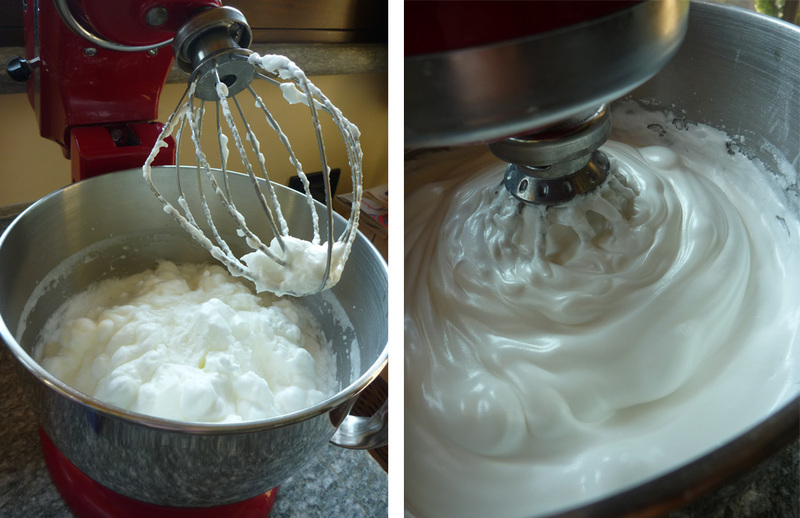 Beat the egg whites until they are white and foamy (see the photo below left). Add the sugar a little at a time, beating constantly until the mix is firm and very shiny. 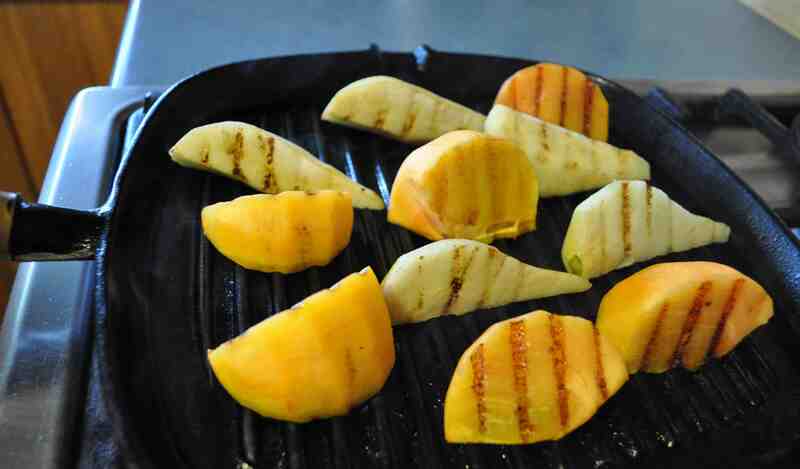 Add the vinegar and cornflour and beat for another 15 seconds or so (photo below right). Transfer the mix to the tray, all piled up. Smooth the mix out to a round disk around 7cm high. Put in the oven and bake for 1 hour or until the meringue is just starting to colour. While the Pavlova is baking it should rise a little. Try not to open the door of the oven too much and don’t touch the tray. After 1 hour turn the oven off but leave the Pavlova in the oven to cool. This is the MOST IMPORTANT part of making a Pavlova. The very slow cooling time finishes the cooking process and prevents collapse on an apocalyptic scale. That said, don’t get too attached to your amazing, solid, statuesque Pavlova. 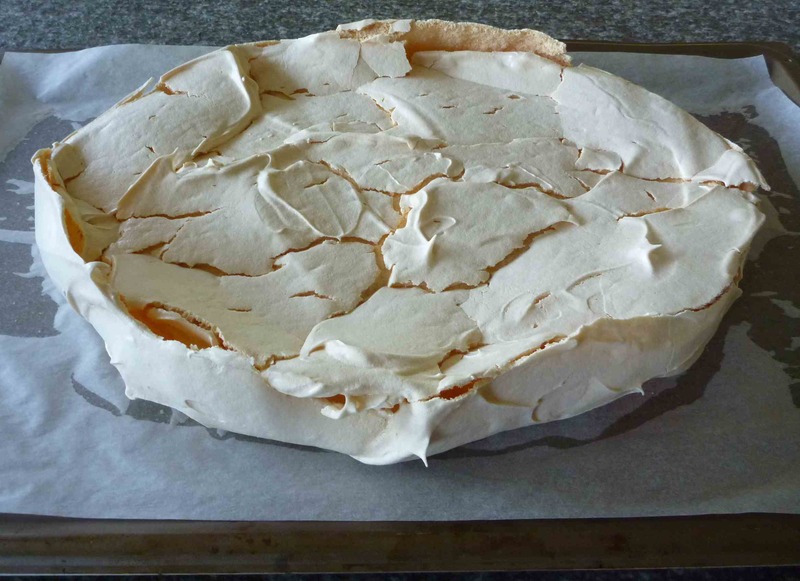 As it cools there will be some collapse on the top and sides as the crunchy outer meringue settles on the soft and chewy inner part. This is normal, don’t panic. 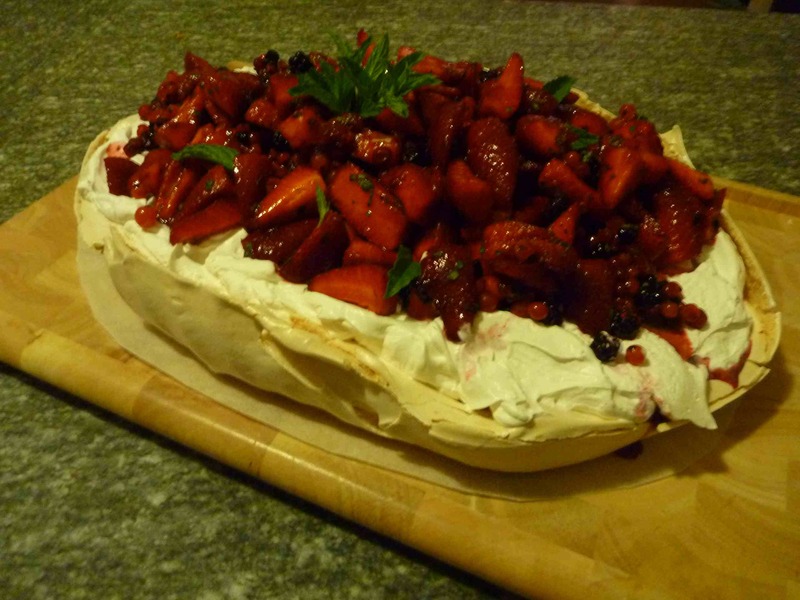 After the oven is completely cool take the Pavlova out, but try and decorate it just before serving. To serve, take full advantage of the crater left after the top has collapsed by filling it with whipped cream (I never add sugar to the cream). Then top the Pavlova with plenty of fresh fruit. My favourite is mixed berries with a little bit of chopped mint mixed through.